Foce presents two tone base spectacular watches. Solid shape and stable mechanisms are for those who likes steady outlook. 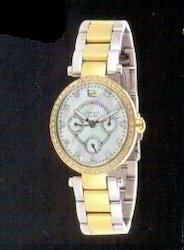 Firm and stable look two tone watches are available in various designs to suit the taste. Hugely accepted for merchandise and promotional requirement. Uncompromised quality assurance, accuracy & functionality is of international standard. A silvertone dial really sets off the two-tone expansion watch. Goldtone hands gleam on the expansion model. Approximate measurements: Expansion band 1/4"W. Expansion case 1-1/8"L x 5/8"W.
A blend of innovation and sophistication, Rado watches are recognized worldwide for magnificent timepieces. INFINITI watches label is a pride and status to own, its collection stands for quality and is therefore committed to uphold a worthy tradition. Our company has the best conditions for first-class products. This is, for example, due to outstanding specialists in the watch industry and a reliable network of qualified personnel. - Classic in mood and e'lan by the soul this is for the modern Indian woman who's classic yet fashionable.